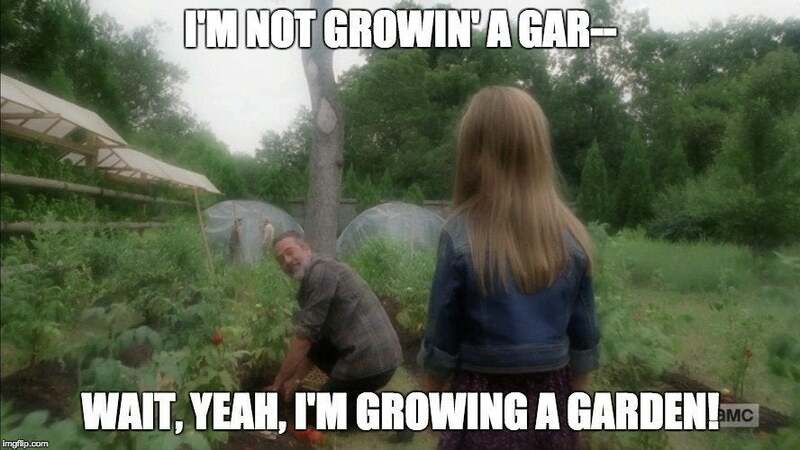 Negan once claimed he was "not growing a garden" on The Walking Dead but in the Mid-Season Eight premiere, he was seen doing just that, in a scene which has spawned some hilarious new memes. Be warned, spoilers for Episode 8x09 follow! In what was revealed to be Carl Grimes' vision of the future as he succumbed to a walker bite and the ensuing virus, Negan was not such a villain after all. Instead, the man best known for bashing the brains of Glenn and Abraham in the infamous Season Seven premiere was doing some gardening in Alexandria's garden, ready to offer a warm welcome to little walking, talking Judith. Since, some of the best Walking Dead memes in years have been born. Though none seem to push the meme further than any of Negan's dialogue on the show, some of the memes will be considers unfit for work. The above meme is a little more kosher than the rest. It's a play on Negan's first words to Rick and company, when he explains that he wants the group to work for him rather than be a bunch of dead bodies. His justification of the demand: "I'm not growin' a garden!" Oh, the irony of Carl's vision. Perhaps he subconsciously remembered the line and it fueled his dreams. The next, however, is a bit more on point with the ruthless Negan dialogue fans have come to know. Negan's first lines on The Walking Dead consisted of asking the group, "Are we pissin' our pants yet?" when he walked out of Rick's trailer, promising to take the group to "Pee Pee Pants City." His grin in the dream sequence makes for the perfectly savage meme above. Below, however, is the most ruthless of them all. In Episode 7x04 (Service), Negan is escorted around Alexandria and takes anything and everything which he takes a liking to. At the the end of the episode, he insists Rick Grimes thank him for the "service" he is providing. After Rick thanks him, he whispers to the Alexandrian leader, "I just slid my d--- down your throat, and you thanked me for it." It was an unforgettable line from The Walking Dead comics shockingly brought to television.